Time flies when you're NOT having fun.....! I can’t believe that it’s been 5 months since I last made an appearance on here. I can only say that much has happened but little of that in my garden! After the shock of the business I work for going into administration pre-christmas and then re-opening in mid January, we pottered along with Ali getting dragged down by her job and picking up something called Labrynthitus which saw her off work for 2 or more weeks. It totally wiped her out and was quite frightening. She’s had a couple of other niggles and finally went to the docs last week and is now going back for 7 blood tests next week as well as for a bone-scan next week as well. She’s just so fatigued all the time and I don’t think the job is helping but we are trying to get her own business set up doing handcrafted items etc and have lots of ideas but just need time to put them into action – work commitments dictate our life at present:0( Add to that 2 problems with the car resulting in over £600 being spent on it, well, it’s been a pain in the posterior BUT, I’m here, alive and kicking and selling like mad on ebay to pay for the wedding, which is only a few months away…..gulp! Anyway, the garden took a bashing through winter and I only just managed to get back out last Friday for 5 hours from 4-9pm and started to make a difference. It still needs a fair bit of work doing on it and we’ve decided not to do any veg this year as we will be away during picking and last year we entrusted a neighbour with it all and….well……we won’t again! 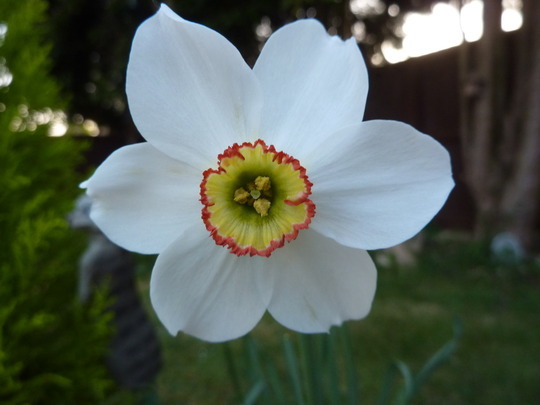 So I will post a few pics for now and hope to be back on here more regularly now as I am getting back into garden maintenance and having a week off in 3 weeks will help as well. I will ry to catch up with everyone over the weeks and look forward to viewing some of your blogs and pics posted whilst I’ve been away. Meantime, a few pics from last Friday….. This little collection is on the right hand side of the steps leading up to the decking. 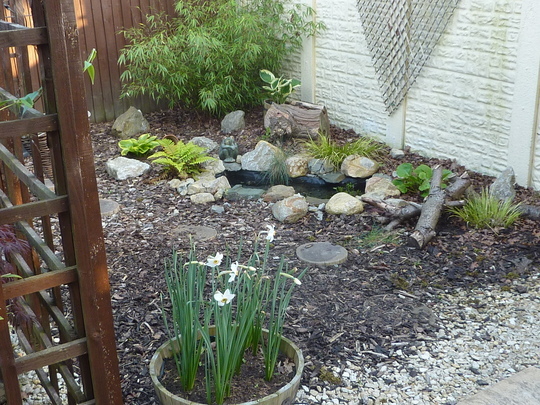 The pond area is looking healthy and everything growing nicely after a couple of years. When I put the pond in, I ordered 5 snails online with all the plants etc. I have counted over 60 snails in there now!! 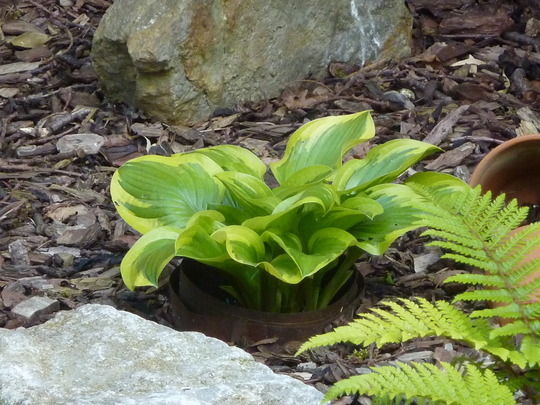 A healthy Hosta near the pond….. 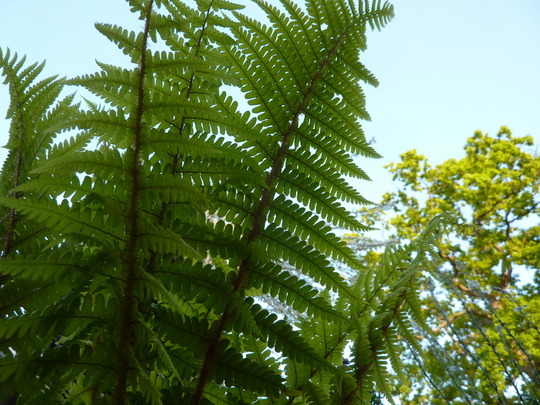 The woodland border is fine and the Budlhia is very healthy. Also planted a little Cherry Blossom on the grass last year which is growing nicely and settled well…. I had to get an arty one in! 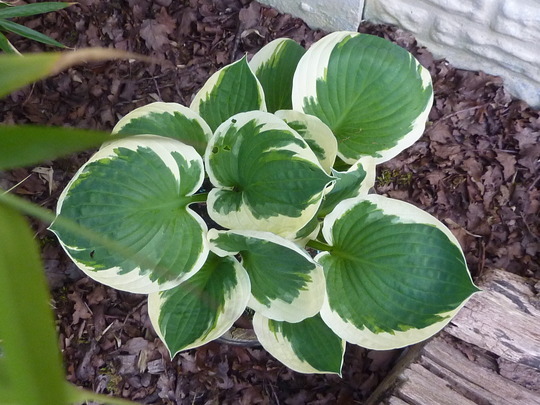 Another healthy-looking Hosta by the pond….. Trying to look disinterested………not working girls! 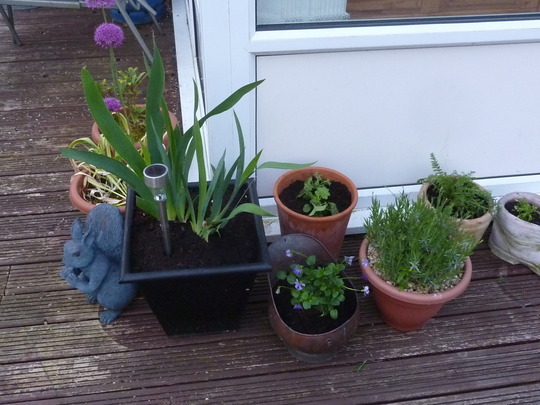 A few different pots here with purples in……when they all flower…. 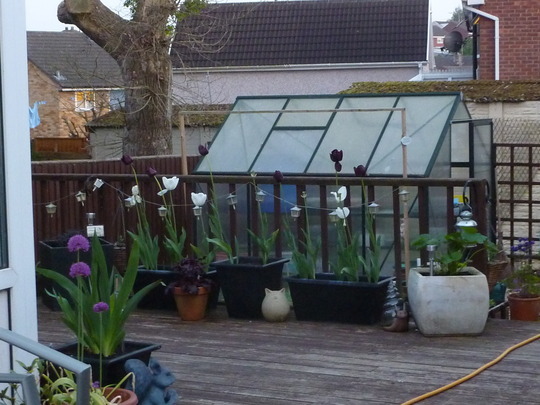 Black and white tulips and in the white tub on the right is ALCEA – Nigra….should look lovely when in bloom. 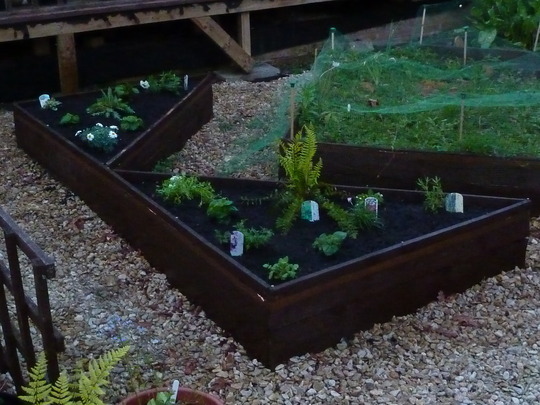 As I said, I’m not ‘vegging’ it this year so I’ve planted up the first 2 veg beds. It was getting late here hence the darker image but it looks quite nice I fancy…. 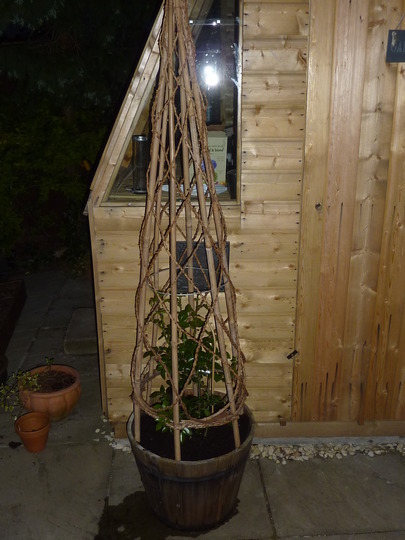 And finally, I planted a rose outside the potting shed in memory of both our mums – never met but both favoured roses! It’s also to celebrate our year with the wedding coming up and is called New Dawn. It appears to have grown in just a few days so fingers crossed! Looking to get a bigger barrel for it but all in good time…. So, that’s it for now but I hope to be back more regularly now I’m back in the swing and look forward to playing some catch-up. For those I didn’t reply to over the past few months, please accept my sincere apologies but I do appreciate your messages. I must admit my gaden is my escape from every day life. Hope the wedding goes well and summer with nice warm weather chases away ilness:-)). Love the idea of the rose in memory of the two 'mums' and hope it really is a 'new dawn' for you both too and that things go better for you. God bless. 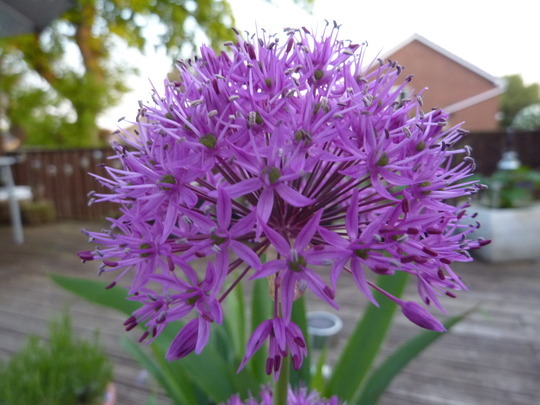 Hi Dan and Ali sorry things have been tough for you both and hope Ali is feeling more herself, like you most of our gardens have taken a bashing or lost plants over winter and takes time to get things back on track. your pics show you have managed to get it back to normal and its looking good Dan, i have snails in abundance to after buying 10 and now 10,000 lol, baz will take some to work as they have two very large natural ponds on the grounds, they will be happy there. 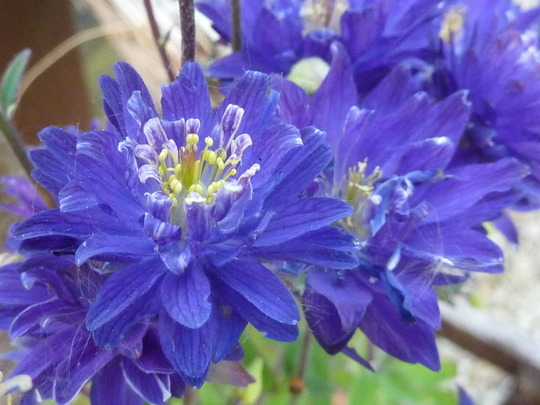 What a lovely aquilegia you have - an abolutely stunning blue. Don't feel too distressed if you haven't got everything done - there are a lot of us like that out here ! Hope everything goes OK with the wedding. hope all's well with tests ugh i hate needles . Well, thank y'all kindly for ya lovely comments! Not sure what's going on with the American accent there! Nice to see some old friends still about and being as friendly as ever.....it's always good to catch up and I'm afraid I have missed out on much over the past several months so apologies whilst I try to catch up and view some of your blogs and pics. Also great to see some new faces and hopefully future GoY friends as well. Gee: Thanks for your comments and Mr Rowan is doing just fine thanks. 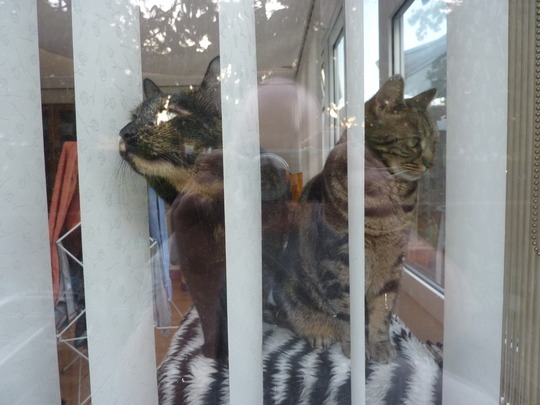 I've taken a pic for you today which will be in a short blog after I've answered this one. The birds are still loving it and it's been nice to get back out there and listen to the Blackbirds singing from up high in the Rowan as the sun sets each evening. Nothing nicer after a long day in work:0)) I shall be checking out your blogs/pics to hopefully catch a glimpse of your little Rowan....good to hear he's doing well. Sanbaz: Great to see you still doing so well with your garden. I did have a little quick peek the other night at a few people's blogs but didn't comment then. Your pond area is looking grand and so natural and again, I look forward to seeing more pics when I go back over your pics on here. Hope you're keeping well and making Baz earn his keep!! Lily: Lovely to hear from you and glad you like the pics....yes, you're only seeing the good bits but only really the side of the decking that needs sorting. Need another 2 ton of Jumbo gravel to cover it so maybe this summer or early next year. 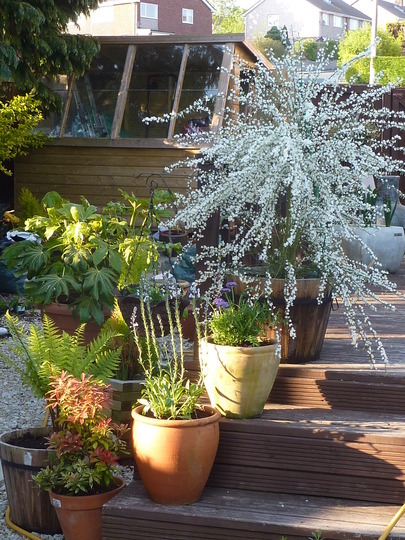 The large 'white' plant is I believe, a broom plant - that's the common name but can't remember the latin. Very nice and survived the winter and better this year. Mariek: Glad you like the Aquilegia....grown from seeds I collected last year. Sent out quite a few to folk on here so if you would like some for next year, let me know and I wll collect and send when they die off in a few months. Cristina: Thanks for your comments and I definitely intend to be around here more often this year. It's been great getting back out there and even spent 2 hours in rain out there today!! Right, I'm off to do a short blog on my 2 hours in the rain....well, technically it was an hour of rain but I was out there just over 2 hours! 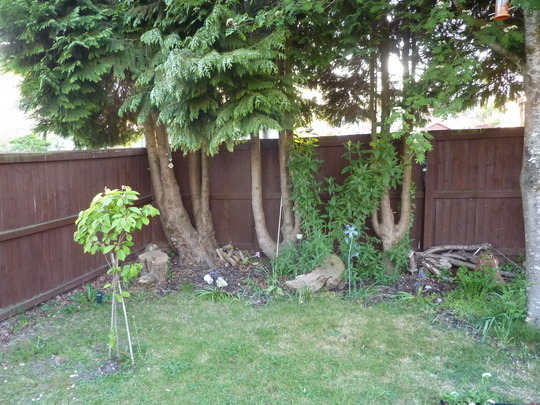 Hiya Dan, welcome back, have to say your garden is looking great, if thats neglect you obviously have it sussed out to the right levels ,lol. Sorry to hear Ali is unwell, hope that gets sorted asap and that she is soon back to full health, I wish you both well with business and especially your wedding plans as you say only a few months to go now..
Lincs: Hello there. Although I appreciate your kind comments please don't be fooled by how it looks now. There is a 'bad' area at the side of the decking, which I intend clearing in a few weeks and what you see in the pics is after some tidying and re-shuffling! Glad you like the arty pic too! Some progress - slowly but surely!